Planet Aid Signs On to Letter Urging President to Support Convention on Rights of the Child - Planet Aid, Inc. 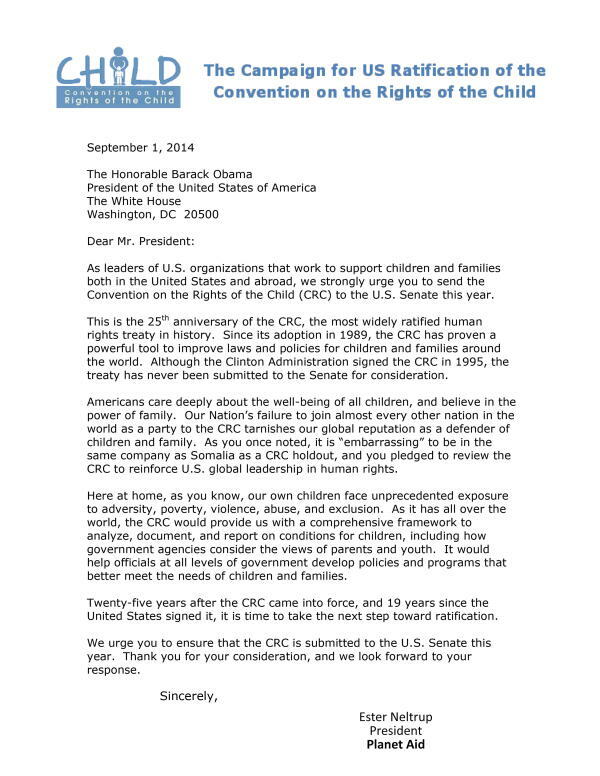 Planet Aid’s President, Ester Neltrup, has signed on to a letter to President Obama urging him to ratify the Convention on the Rights of the Child (CRC) as we mark its twenty-fifth anniversary. The Convention on the Rights of the Child (CRC), the most widely accepted humans rights treaty ever, protects and promotes children’s rights. The U.S. signed the treaty in 1995, but former presidents have not taken the next step toward ratification by submitting it to the Senate. The United States and Somalia are the only two countries in the United Nations who have not ratified the treaty. The letter, organized by officials at the U.S. Fund for UNICEF and the NGO alliance InterAction, has garnered the signatures of numerous other CEO’s and senior officials who wish to show their support for the well-being of children here and abroad.